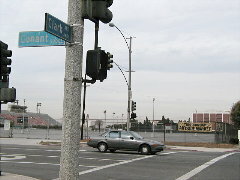 (February 18, 2003) -- After a two and half hour hearing, the City Council has voted 6-3 (Reyes-Uranga, Webb & Lerch dissenting) to approve use of part of the Veterans Stadium parking lot on Clark Ave. at Conant St. for seven day a week rental car and airport employee parking. The Council majority -- including airport impacted area Councilmembers Dennis Carroll and Jackie Kell -- supported the city management desired plan and rejected the appeal of LBHUSH2 president and 8th district homeowner Rae Gabelich. During the hearing, Ms. Gabelich said City Hall is violating the CA Environmental Quality Act (CEQA) by seeking to expand Airport parking for rental cars and airport employees onto the Veterans Stadium parking lot. She illustrated her testimony with overhead maps by showing ten airport area projects -- ranging from hotel expansions to additional parking -- serially approved by the City Council in the recent past. Councilmembers Dennis Carroll and Jackie Kell both spoke against Ms. Gabelich's appeal. Councilman Carroll said City Hall is trying to accommodate "what's on our plate" (flights allowed under the Airport noise ordinance). Councilmembers Uranga, Webb and Lerch variously indicated they wanted the proposal evaluated in an environmental impact report. Councilmembers Webb and Lerch both said they agreed with Ms. Gabelich that City Hall had been engaging in piecemeal airport expanion. Deputy City Attorney Mike Mais said expanding the airport related use on the site didn't violate CEQA because the use (parking) wasn't changing; the lot handled parking before and would handle parking thereafter. Ms. Gabelich said the Veterans Stadium parking was for occasional events, while the airport related parking would operate seven days a week. A number of residents from both ends of the Airport (ELB/Los Altos and Los Cerritos/Bixby Knolls/NLB) spoke against City Hall's plan; one airport area businessperson spoke in favor.